The Mount Pleasant High School Theatre department competed in the UIL One Act Play competition at Sulphur Springs High School on March 5, 2019. This year’s production was “The Tell-Tale Heart” by Luella E. McMahon, based on the work of Edgar Allen Poe. 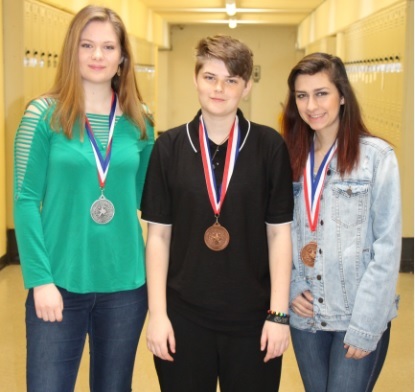 MPHS brought home three medals from the competition with Junior Savannah Mack named to the All-Star Cast for her portrayal of “Man.” Named Honorable Mention was Sophomore Lexie Humber a member of the All-Star Cast for her portrayal of “Visitor,” and Freshman Rian Richie was named to the Honor Crew for outstanding work as the stage manager. In “The Tell-Tale Heart,” a young man plans and commits the “perfect crime.” The only trouble is, he can’t stop the pounding of the dead man’s heart. As the pounding grows louder and the tension increases, that is when the audience realizes that they are watching the very madness of a murderer. “The Tell-Tale Heart” featured Mack as “Man,” Vanessa Buendia as “Neighbor,” Reese Loving as “Wife,” Humber as “Visitor,” Sashi Poudel as “Officer One,” Vanessa Vasquez as “Officer Two,” and Lesley Ortiz as “Roomer.” The MPHS Stage Crew included Richie as Stage Manager, Sharon Zambrano as Backstage/Make-up Mistress, Kendall Minter as Backstage/Costume Mistress, Matthew Phillips on Light Boards, and Peyton Hein on Sound. The alternate was Zachary Alexander. The students were under the direction of Crystal Peel and Crystalla Anderson. 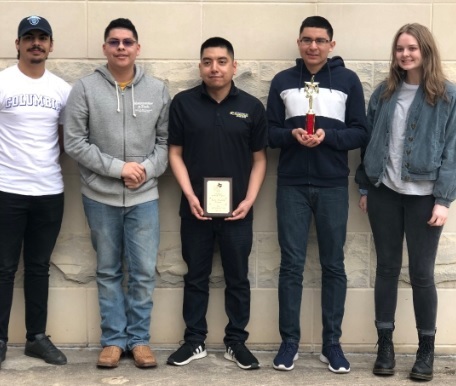 The Mount Pleasant High School math team competed in the Texas Math and Science Coaches Association (TMSCA) State Meet during Spring Break. The meet was held at the University of Texas at San Antonio on March 16, 2019. In Mathematics, the team of Jose Liera, David Barboza, Shelby Courreges, and Miguel Segura placed 3rd out of twenty-six 5A teams competing. Individually, Liera placed 3rd, and Barboza was 8th in 12th grade, Courreges placed 10th in 11th grade, and Segura was 9th in 10th grade. In Calculator Applications, the team of Liera, Barboza, Segura, and Samip Poudel placed 7th. The Texas Math and Science Coaches Association dedicates itself to promoting excellence in math and science through competition. Membership is limited to Texas public and private schools, by campus. Osias Hernandez coaches the MPHS Math team, and they will compete at the district meet March 29-30.